Earlier this week, two academics published an insightful Fair Trade infographic that sheds some light on the current rift in the Fair Trade movement. Today, I try my hand at putting data from our CAFE Livelihoods project into an infographic that may contribute to the discussion. Our project data from the 2010/11 harvest suggest that Fair Trade coffee sold through Direct Trade relationships with fully committed Fair Trade companies earns a higher price than Fair Trade coffee sold through more traditional, mediated channels. 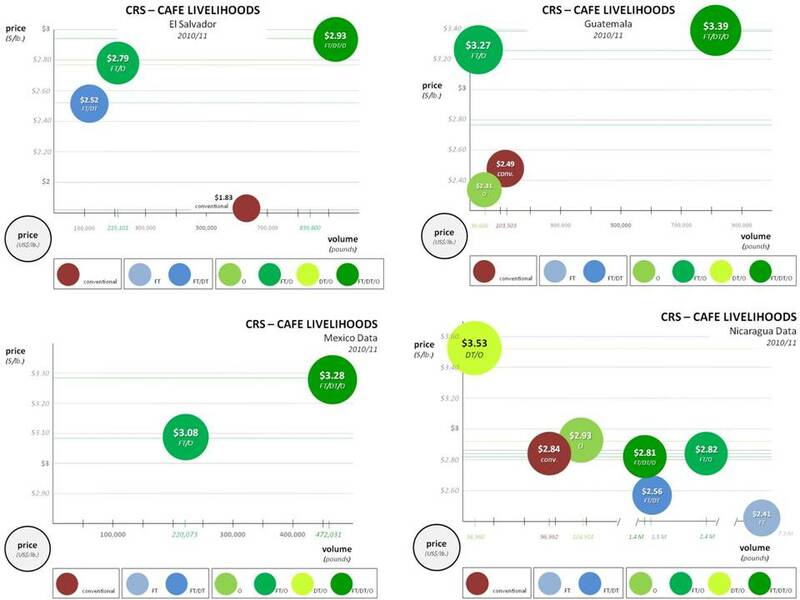 This chart is an aggregation of the data analysis we have performed on the country level in each of the four countries where we implelemented CAFE Livelihoods with our cooperative and NGO partners. 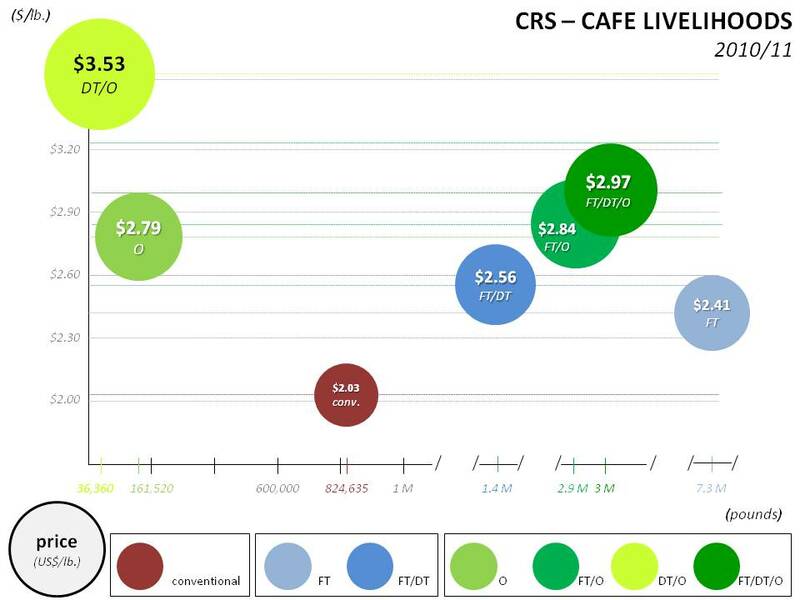 What the data show is at one level consistent with what we think we know about coffee prices: organic certification (average price, $2.79/lb.) and Fair Trade Certification ($2.41/lb.) both add value to smallholder coffee, especially when they go together (average price for FT/O coffee: $2.84/lb.). This particular data set suggests that organic certification may have been more valuable than FT certification: certified organic coffee came in 38 cents higher on average than coffee that was just FT Certified. And the average price for coffee that had both organic and Fair Trade certifications (FT/O) was only 5 cents per pound higher than certified organic coffee, but 43 cents per pound higher than the average price for coffee that had a stand-alone FT Certification. The other suggestion the data make is that all three of these certification options — organic, Fair Trade and FT/O — are associated with higher average prices in the context of direct trading relationships. The “Direct Trade premium” was 15 cents per poundfor FT Certified coffee(from $2.41 to $2.56) and 13 cents per pound for FT/O ($2.894 to $2.97). The significant “DT premium” for certified organic coffee (74 cents per pound) is explained by the fact that the DT/O coffee that fetched an average price of $3.53 per pound was of extraordinary quality. This reflects one of the two principal flaws of these data: they do not take into consideration price differentials for quality, even though we know that there were significant quality differences bewteen coffee lots sold within each of the trading categories identified here. Nor does the data take into consideration the date at which prices were fixed. When farmers in El Salvador started fixing prices in September 2010, the average NY “C” price for “other milds” was $2.22 a pound. By April 2011, it had climbed to $3.04 a pound. In other words, the value of coffee with the same certifications and quality profile rose over time — this variability is not captured by this data analysis. Furthermore, we know that price is only one dimension of trading relationships. There are others that must also be examined to get a fuller picture of the relative value and developmental impact of different trading approaches: access to technical assistance, finance and project funding, transparency and trust, etc. We will be applying these criteria retroactively to our CAFE Livelihoods data set, and building them proactively into the DNA of our monitoring and evaluation systems for future work in coffee value chains. Meantime, I thought these data were interesting enough to publish here on their own. Thanks for keeping the insightful analysis flowing! The data you report in your post from today measures income/price differentials, and suggest such measures are suggestive of impacts of certification/FT. I think they are very misleading, since costs are known to be much higher for producers active in FT or certification. So, a much better measure would be net income differentials, taking price and subtracting unit cost. It is possible that certifications hurt producer income if marginal costs exceed marginal price increases. Producers and advocates have often berated the high costs of FT certification on producers. Thanks for your comment and for your/FTRN’s good work in “covering” the changes afoot in the FT system. You are right, of course, that data on net incomes are far superior as indicators of financial well-being than gross revenues. The groundshaking article in Ecological Economics earlier this year helped us learn the lesson that coffee revenues are not adequate as a proxy indicator for net incomes. However, the key point with these graphs is the differential between prices paid by the Direct Trade segment of the Fair Trade market and those paid in more traditionally intermediated channels with little to no contact at origin with farmer organizations. The cost structure for serving these two markets is generally the same. In fact, most of the sales data we have for our partner organizations in the CAFE Livelihoods project reflect sales to both the DT and non-DT segments of the FT market. While some of the Direct Trade actors may have higher quality standards and therefore higher labor requirements, in general we assume that the underlying cost to bring coffee to both segments is roughly the same. But as the Ecological Economics piece demonstrates, it is best to test these assumptions. Which we will do moving forward in all our coffee work at origin. Though I agree with Jeff (and you) that net income to coops, if not farmers, would be even more illuminating, what you’ve done here is fantastic and worthy of emulation. In fact, I wonder if it could form the basis for a tool to help coops determine if a given certification is paying off for them. It could be simple, weighing the largely fixed costs of certification against aggregated extra revenue (price premium x per market volume), or it could be more complex, factoring in quality grades, impacts on productivity (e.g. organic), in real-time, etc., for more technically advanced coops. Who knows, it could be a good management tool if it could be implemented. If adopted widely, the aggregate data could also be useful for standards development, at least for Fair Trade. 1. Are you able to add #of contracts and #of different buyers to each circle? High numbers would support your conclusions, whereas lower numbers open up other possibilities. For example, with low numbers, higher prices in one category may be more reflective of the buying tendencies of specific buyers than of a particular market. 2. What is included in your conventional category? Specifically, have you got specialty buyers (non-DT), domestic, and commodity grade coffee all lumped in there? 3. Can you provide any insight into why you have higher conventional prices relative to most other prices in Nicaragua? I suspect it’s either the timing or quality limitations of the model you mentioned, but it would be good to know if it’s something else. 4. Could you also include the median price and/or the price spread in each category? 1. Are you able to add #of contracts and #of different buyers to each circle? High numbers would support your conclusions, whereas lower numbers open up other possibilities. For example, with low numbers, higher prices in one category may be more reflective of the buying tendencies of specific buyers than of a particular market. Indeed, the larger the sample size the more reliable the data. I can (and will, once my current bout of travel and illness ends) add the numbers of buyers and contracts to the graphs. Meantime, my suspicion is that the volumes on the x-axis are a pretty good proxy for the numbers of contracts and buyers. 2. What is included in your conventional category? Specifically, have you got specialty buyers (non-DT), domestic, and commodity grade coffee all lumped in there? I do, indeed. I will sure to disaggregate them in the next iteration of the graph. Thanks for pointing out this (fundamental) methodological weakness. In general, we might have created a broader typology of trading channels that reflects more accurately the diversity of the marketplace. Specifically here, I am thinking of brands (whether importers or roasters) that are built around the concept of quality-differentiation. I will see whether it is possible to introduce a bit more nuance in the next version. Another limitation of the data is that we haven’t achieved total end-to-end traceability: the coffee trail in our data in most cases ends with the importer. This is something we will be sure to focus on in future projects, since many importers trade lots of different grades of coffee. Knowing who imported a particular lot doesn’t tell you a whole lot on its own about quality. Having data on the roasters at the end of the chain would help characterize the coffee more accurately, and even better would be triangulating the roaster identity with lot-specific data on cupping scores and prices. With the smaller coops we accompany at origin, this has been easier to achieve. With the larger coops moving hundreds of containers, it has proven harder. On the buying side, we have deeply appreciated importers like Cooperative Coffees, whose total transparency approach to trade has made it easy to track this kind of data. 3. Can you provide any insight into why you have higher conventional prices relative to most other prices in Nicaragua? I suspect it’s either the timing or quality limitations of the model you mentioned, but it would be good to know if it’s something else. Yes, it is quality and timing. Some of the conventional coffee came from the quality-obsessed 5 de junio cooperative and earned quality premiums; in other cases, coops had access to credit which allowed them to tide over their members and hang in there longer as the market rallied, fixing prices later at a higher level. These are very interesting and useful data. I think you should be careful in attributing the observed differences to the certifications. This is known in the econometric/impact analysis literature as a “treatment effects” problem. Growers and co-ops were not assigned randomly to the “control” and “treatment” (certification, DT) groups, meaning that they likely differ in ways other than their participation in certification or DT. You mention one such difference, coffee quality. There are likely others, including organizational capacity, quality of leadership, network connections, etc., and you can’t determine from these date if the price differences you note are attributable to the certifications or to these other variables. The most well-known “impact studies” of FT suffer from this same problem. You are absolutely right. And I should have known better. The issue you raise about treatment v. control groups is fundamental for attributing observed results to project interventions with any credibility. In the context of our CAFE project, which coincided with three years of steadily rising prices, attributing price increases exclusively to the project without control group data would be impossible. But in this case, I was not looking to attribute these price data to CAFE project interventions, but just to compare prices across different market channels from within a treatment group with a fairly high level of homogeneity in terms of farm size, education levels, family sizes, etc. Perhaps more relevant here is the concept of omitted variable bias — data skews that result from failure to gather and analyze data on variables that are highly correlated with the project outcomes we are tracking. There are plenty of variables beyond the trading channel that may be correlated with the prices shown here. In my original post, I mentioned just two omitted variables that could have explained some of the price differences reflected here — coffee quality and the date on which prices were fixed. But there are a range of other variables that could just as easily explain some of the variance in prices. These include demographic data (such as level of formal education), overall household income data (such as poverty/asset levels), commercial data (duration of trading relationship), etc. We are building into our next generation of coffee programming the capacity for econometric analysis. In the meantime, if we were to do more rigorous analysis based on the data we have, what are the key variables you would recommend we try to control for before feeling comfortable with the attribution of these prices to trading model? If the question you’re looking to answer with this data is, “which certification (if any) has the most impact potential for producers”, then clearly you have to account for the attribution problems Matt rightly points out. 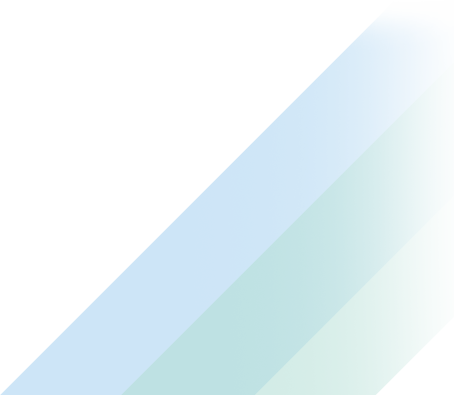 But I’d like to raise again the applied value of your approach, even as is. Coop managers presumably have a better handle on many of the variables discussed (quality, timing) so would be better positioned to interpret the data for their own particular circumstances. As well, because they wouldn’t be generalizing outside of their own operations, questions of organizational capacity, leadership, networks, etc. wouldn’t be the vexing (unknown) variables that they are when you try to use this data to answer more generalized impact questions. So while there’s still a lot of work to do to answer the broader questions, it seems to me that you’ve got a strong base for the development of a really good management tool that may just need some technical work.